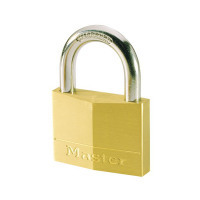 • Manufactured from solid brass, with a hardened steel shackle. Supplied with 2 keys. Whether you're locking up your front gates or securing your storage unit this Master Lock Brass Padlock is the ideal security system. Made with a solid brass body and hardened steel shackle this padlock is reassuringly cut-resistant to ensure protection for your personal property. This padlock has been designed with dual locking levers and a 4-pin cylinder, which means essential protection for your possessions and peace of mind to know you're guarding against theft.